There will be 12 Regional Qualifying Heats (RQH) for Agility and 12 Regional Qualifying Heats (RQH) for Jumping. These heats may be conducted independently of, but in conjunction with, an ANKC trial. All RQH classes will be conducted as a one round event, which is open to all dogs eligible to compete in any ANKC Agility class. Entry into the RQH will be via Official Show Entry Forms as required for an ANKC trial or online via e-performance or equivalent online format. Each event will be catalogued as per normal ANKC rules but there will NOT be the option of running an RQH in separate height Catergories. Both RQH courses (Agility/Jumping) will be designed similar to an ANKC Open level for both Agility & Jumping courses and must consist of 20 obstacles. The RQH must be judged under Open rules and Open Standard Course Time. The exception will be the exclusion of the Distance Handling Section and it will be mandatory to include the 12 Weaving Poles in an RQH Jumping Class. Presentations. No qualification cards will be issued in this event, however, the Agility Committee has commissioned a special 'Clear Round' sash to be presented for clear rounds achieved at this event. Clubs can order these from the Dogs NSW Office or supply their own. The Clubs are to provide trophies for winners and place-getters as they do for any other Trial Classes. 1. 40 points for 1st place, 39 points for 2nd place etc down to 1 point for 40th place. 2. 40 points for 1st place applies to all heats regardless of the number of entries. Points are only awarded to dogs that have not been disqualified. Tied results. To calculate points for a tied result add the points to be awarded for that place, plus the next position/s and divide the result by the number of tied dogs. For example if three dogs tied for fifth place (assuming there are 40 dogs entered), then 5th place would equal 36 points. Take the next two places 6th place (35 points) and 7th place (34 points), add 36+35+34 = 105, divide by 3 (number of tied dogs) = 35. Each of the dogs would receive 35 points. CANCELLED TRIALS. If a Trial is cancelled for whatever reason and that club has been assigned a RQH round, that round will also be cancelled. If time does not permit for the RQH to be reassigned for that year, then that RQH round will be cancelled. Awards for the Balder Trophy and Geronimo Cup will then be highest aggregate score in 6 out of the number of completed RQH rounds. This method will also apply to the awards for the Separate Height Categories. The Balder Trophy will be awarded to the dog/s who obtain/s the highest aggregate score in 6 out of the 12 RQH or completed rounds for Agility. In the event of a tie, the Trophy will be shared. The Geronimo Cup will be awarded to the dog/s who obtain/s the highest aggregate score in 6 out of the 12 RQH or completed rounds for Jumping. In the event of a tie, the Cup will be shared. (from 2017 events) Height Class Award - at the conclusion of the Annual RQH Competition, Trophies will be awarded to the dog with the highest aggregate score in 6 out of the final number of completed RQH events in each of the Separate Height Categories (ie 200, 300, 400, 500, 600). 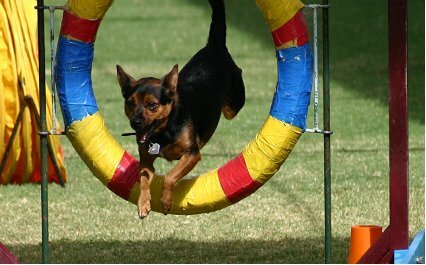 Both finals will be conducted at the Dogs NSW Festival of Agility each year. Dogs placed in the top 40 places (with the highest aggregate scores from a maximum of 6 scores in each RQH’s (Agility & Jumping) will be invited to compete in the appropriate Final. Both Finals will be conducted over ONE ANKC Open Course. Both courses (Agility/Jumping) will consist of 20 Obstacles and be designed similar to an ANKC Open (Agility/Jumping course and judged under Open rules and Open Standard Course Time. The exception will be the exclusion of the Distance Handling section and in the Jumping Final 12 Weaving poles will be included. Trial Secretaries should ensure that contracted judges officiation at RQH classes are aware of the rules for these events. The Dogs NSW Agility Committee would like to advise all Agility Judges that the Regional Qualifying Heats for the Agility Dog of the Year and the Jumping Dog of the Year will continue to be designed as a 20 (twenty) obstacle course. The course set is to be of a standard equivalent to that of the Open Class, but it will be mandatory to include the 12 weaving Poles in a Jumping RQH course. The Regional Qualifying Heats in both Agility and Jumping will be judges according to the ANKC Rules for the Open Classes in Agility & Jumping. - There will be no Distance Handling Challenge in the course. - In the RQH Jumping Course - 12 Weaving Poles must be included.